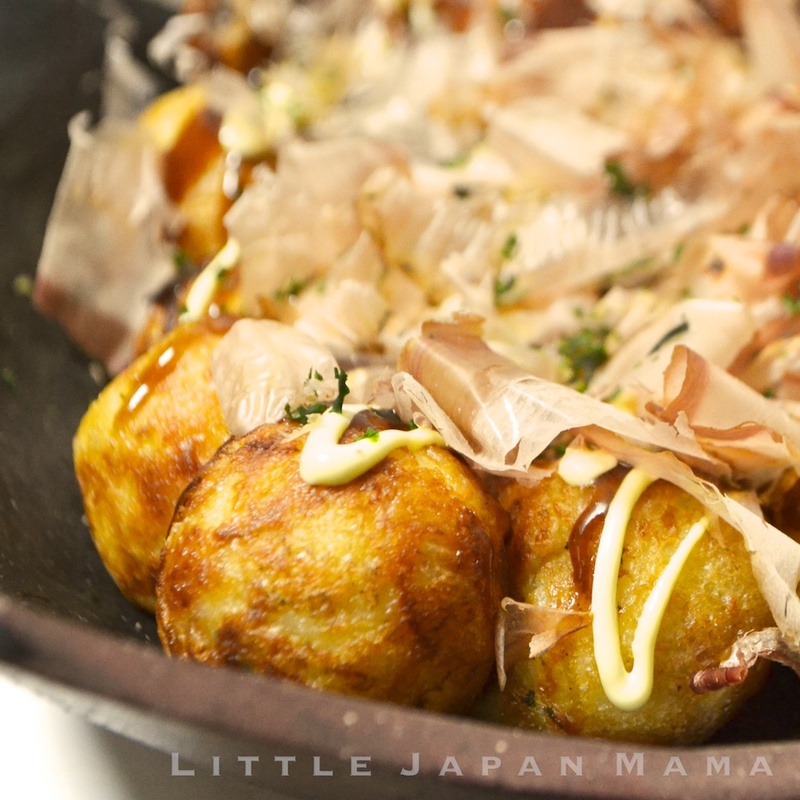 ❤　little japan mama　❤: Perfect Takoyaki, from Plain Flour! Oooh, this looks delicious! I want a takoyaki maker but there just isn't the space in my kitchen at the moment. One day, one day, and I'll use this recipe! Deena, Yes! Sakura-ebi are delicious in Takoyaki and Okonomiyaki! Good to hear your takoyaki plate is getting good use! For others' benefit, where did you get it and how much? I actually don't really like the cheap electric takoyaki makers, I think the heavy cast iron plate like you have is much better (and probably cheaper). We've also used one like yours on a gas cooktop and also a portable gas cooker. Makoto's multi-function Takoyaki maker includes a heavy cast iron takoyaki plate that sits perfectly on an electric element. It's by far his favorite out of about 3 takoyaki makers that he had at his parents' house. Tried it and worked perfect! Pickled veggies like daikon and kimchee are really good. Pizza yaki using cheese as the filling and pizza sauce on top is really good too. You can also put seitan in there. Yes, we love making it with either kim-chi or cheese too! If you can find a particular cheese you like, that would work. I've also heard that tofu can be used as a meat substitute, but I'm not sure how you would go about preparing it (besides boiling). JUST BUY A PACKAGE TOFU, CUT A SMALL SLICE AND PUT IT WITH THE SHRIMP, OCTOPUS OR CHEESE, A BIT OF SPRING ONION, A TOUCH OF WASABI POWDER (WE DO) AND BOY, WE LOVE THIS FOR BREAKFAST-LUNCH OR DINNER AND IN BETWEEN. WITH A ELECTRICAL TAKOYAKI-MAKER, YOU CAN PUT THIS ON THE DINNER TABLE AND LET YOUR GUESTS MAKE THEIR OWN, WITH WHAT THEY LIKE. Use a kombu based or mushroom stock for the dashi part since that's from fish and swap out the octo for something else and you should be good to go. Will be a different taste though. I am waiting for my takoyaki pan to be delivered and in the meantime, I'm researching on simple takoyaki recipes. Yours seems to be the simplest I found. I can't wait to try it out! Is the batter supposed to be watery? Yes, the batter is quite thin/watery. Takoyaki has a thick custard-like texture inside. If the batter is too thick, the takoyaki will turn out doughy inside, which is not nice. If the batter is too thin, the finished takoyaki will still taste alright, but will take longer to cook. We practiced many times with various water/flour proportions, and made this recipe when it was just perfect. Hope it works for you too! Hello, I just have a question about the plain flour, could I use all purpose flour for it?? All-purpose flour can be used for this; it turns out just fine! Hi Shinobu san, your blog very inspiring and useful, I trust all of the content since the author is genuine Japanese (and I read about your half and half ancestor, you still back to Japan, I love Japan too, I hope someday I could travel there :D ) :). 1. Is there Takoyaki sauce that did not contain alcohol inside ? (FYI I don't consume alcohol). Surprise me that the sauce I already buy was contain alcohol (my mistake didn't read carefully). 2. Can I change dashi powder with mushroom powder (this to avoid msg)? You can use Okonomiyaki sauce instead of Takoyaki sauce (after reading the ingredient list, there is no mention of alcohol). Wow! This recipe kills all the other ones out there. This is by far the best one Ive tried and believe me, I've tried many and this one is the best. You can get it crispy using the special technique and the inside is creamy soft like the restaurants. Yummo! Thank you so much for this recipe! I couldn't understand why my balls deflate after I remove them off the pa but now I know!!! It works guys! So so happy I found urs. Thank you again :D takoyaki party baby!Hmm should we save it for when we go out together with the boys?? Living in Oklahoma USA, all we get is crab, shrimp and lobster fresh in the bigger stores in cities. I know what octopus taste like having been to Japan. Does it have to be octopus? Shrimp is a good alternative, as it has a great flavor when boiled and is a good beginner meat if you're uncomfortable with octopus. I'm not sure about crab or lobster, but try it out if you're experimenting to figure out which kind you like the most! This recipe certainly lives up to its name! We used an ebelskiver pan for this one and substituted boiled shrimp for the octopus (almost any meat can be used if octopus is not your favorite, but shrimp is a good beginner meat). The corn starch really helped with the thickness and texture as well as keeping the finished product from deflating when transferring to the plate. I also recommend adding oil gradually with a brush as it cooks so that it keeps a nice, crispy texture and will completely cook inside (slightly gooey, but substantial). As for the heat, we recommend a medium setting (on electric stoves, between 5 and 6) so that it'll cook quickly enough to avoid a gooey mess but still give you time to turn the balls. Hope this helps! Great recipe! Hi. I noticed that you listed chicken stock as an alternative to dashi powder. Is there a difference in taste if I use chicken stock? And i love your blog! I just stumbled unpon it, which is absolutely crazy since I have a bento/cokking/stuff blog myself! You should check it out, also I love some of your ideas, they're great! It’s a lot of work to get them into the proper shape. You have to be constantly turning the balls. I found a video online of the people making them. It’s about 10 minutes of turning. Exhausting! Hi I was wondering, is there any substitution for the eggs? Usually I use eggs but sometimes I run out, so I'm wondering if there's anything else I could use. Hello, I have successfully made takoyaki using half the number of eggs, but I don't know of any substitute, sorry! Iam Sofie, from malaysia. 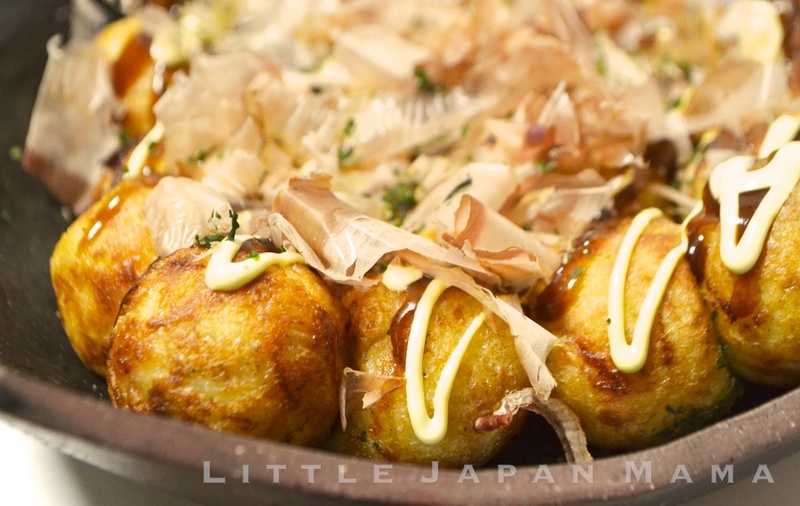 Tumbs up for the takoyaki and okonomiyaki recipes. Perfect combination. Thanks, Sofie! I'm glad you're enjoying it! 17 euros and it works perfectly well!! ooo! this recipe does not need eggs? uh, sorry, yes, it does need eggs. By "from plain flour", I mean, you don't need to buy takoyaki mix or any special flour. Do you necessarily need a takoyaki pan to make takoyaki? Is there some kind trick to making it without it? I'd love to make takoyaki, but I don't have enough space in my kitchen or my budget to invest in a pan. Sorry, I don't know of any other way to make takoyaki than in a takoyaki pan. Good luck! Hi KittyExpress! So glad you enjoyed it! Is it possible to make the batter in advance? For instance, if I'm making a large quantity for a party the next day, would it be fine to store this overnight in the fridge until needed? Hi, I've never made the batter more than half an hour before using it, so I'm not 100% sure! but I think the batter is best made the same day. Party sounds fun! Good luck! Thanks for formulating this batter recipe! Tried it today and it was a hit. Though maybe next time I'll try doing the batter with only one egg because I want my takoyaki crispier/dry on the inside. This is the best (yet very simple) takoyaki batter recipe ever. THANK YOU VERY MUCH! Though it's very hard to find takoyaki sauce on where I live so I just used Bulldog sauce and I mixed it with honey, sweetblend ketchup, a dash of dashi and half a sachet of Katsuobushi. So perfect. im from philippines its really hard find takoyaki specially in province are,one day i saw takoyaki store in mall i buy one served but i notice the sauce is different its like sweet and spicy or sweet and sour. . do you have perfect recipe for this sauce and thank you for your takoyaki recipe its verry simple and affordable for my area. Hello Adriano! Thank you for your comment! I have tried making okonomi sauce, but to no avail. Tonkatsu sauce is the next best thing. If you can't get any Japanese sauce, then steak sauce or barbecue sauce mixed with Worcestershire sauce and soy sauce. Was the closest I got. can you help me for sweet and spicy sauce recipe, japanese sauce here is very expensive and i cant afford to buy may be this cheapest sauce available to my kitchen but i don't have a perfect recipe for this. takoyaki store used this sauce with mayonnaise and instead of Katsuobushi they used they used mahu fresh meat seasoning. .. please help me i decided to run a cheap takoyaki store in my area ..
Hi. I'm from the Philippines too. If you want to achieve an authentic takoyaki sauce, you need to buy Bulldog sauce (you can find in SM supermarket for 175 pesos per bottle) as well as Kewpie Japanese Mayonaise it costs 75 pesos per bottle and a 5 sachets of Katsuobushi for 90 pesos. Heh. 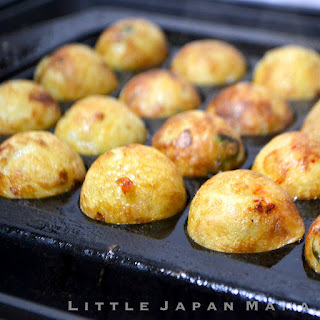 Great posts on takoyaki. Thanks! The recipe worked first time! My only sadness is the balls don't stay crispy for long. I might try adding baking powder to try and get more crispness. They do this on fish n chip batter. Maybe it'll work for this ! Also: I substitued chicken stock with curry powder. Very tasty. Rice flour is also used to make things crispy when fried (tempura), it might be worth trying. Untuk penggunaan kemasan makanan menu bento dapat coba menggunakan dus makanan murah tipe 5c-2314. Masih menggunakan styrofoam?? Lebih baik jangan. I am glad to stumble upon your website. It is very important to keep up with your excellent posting. Given that you said the cups are Australian metric, should we assume the Tablespoons are 20mL Australian Tablespoons? Very nice share, it is very useful for us. Thank you very much. I come from Thailand. HOW ABOUT THE CHICKEN STOCK IS IT STILL 1 TSP? Thank you so much for the recipe. I just tried your recipe and it worked out great plus it didn't stick to my cast iron takoyaki pan. I used to buy takoyaki flour mix and that sticks like crazy in my pan I end up frustrated and think I shouldn't have made all these effort for nothing! Such a pain to clean up but your recipe is heaven sent! Can I say I love you? I just bought a Takoyaki maker, and I want to make takoyaki real soon. But in our place, Tako (Octopus) is not a common thing to sell. I do not see it in markets near our place. And, unfortunately, I was advised not to eat shrimp due to allergy. Can I substitute Ika (Squid) instead of Tako? Will it make a difference? Please advise. Thanks ahead! Since I cannot find Tako yet, I tried this batter but I used only cheese and cabbage (for practice also since this is my first time making one) and yes it was good ! :D Crispy and it doesnt collapse even when cold alredy! Hi Angeline Ygrubay, thank you for your question! Yes you can definitely substitute squid or prawns or whatever you like. Just make sure that the squid or prawns (or any meat or seafood) are cooked first. For squid or prawns, boiling them in rapidly boiling water is the easiest way to prepare them for Takoyaki. Enjoy! Hi Anonymous, Yes cheese and cabbage are also delicious substitutes in takoyaki! Thank you! Could I use an ebelskiver pan to make takoyaki or does it have to be a takoyaki pan? What kind of flour is that?is it all purpose,baking flour etc? How much octopus is used in this recipe(lbs)?